Life in a modern family can be chaotic. Demanding schedules and endlessly competing needs make order and serenity a challenge to say the least. Therefore, perhaps now more than ever, a home must simultaneously act as an organized control center for activity as well as an oasis to get away from it all. Achieving peace takes a focused mind, but also calls for practical and multifunctional choices in furnishings. Built-in units designed specifically for your home are able to satisfy the multifaceted needs of today’s consumers. Custom furniture (or custom anything, for that matter) typically brings to mind the idea of luxury and style. “Custom” says that you care about your home, care enough to go to the extra effort and expense to incorporate pieces that fit your individual space to a proverbial “T.” While custom built-ins absolutely embody these high-style qualities, a high-style price tag is not necessarily a given. Adding built-ins can be affordable, while simultaneously adding significant intrinsic and resale value to your home. 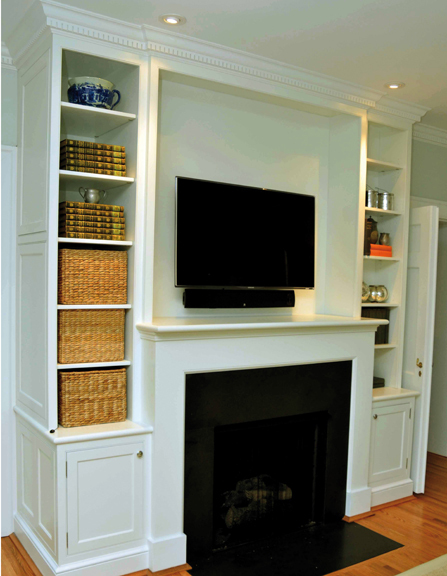 Just as the nature of custom furniture implies, built-ins can fit into virtually any space. A bay window in the dining room, an awkward empty second floor hallway, or a basement laundry room are all appropriate and practical places to build a custom piece. By sidestepping any kind of spatial restrictions or availability options of ready-made pieces, built-ins provide true versatility in any space. What makes built-ins such sought-after additions? For starters, functionality. Nothing quite has the power to bring order and organization to a space like built-ins, with good looks and sophistication to boot. Yet, it doesn’t stop there. Built-ins take functionality to a new level by offering a space true multi-functionality. Built-ins often are able to serve two or three purposes at once, thanks to versatility in both design and construction. For example, a built-in shelving unit with drawers and hooks just steps from the front door offers the perfect place to not only drop your keys, but also file mail and hang your coat. Or, if “home” includes a growing family, built-in cubbies with open shelving in a child’s playroom could act as storage for toys, and as a place to display memorabilia. Either option has the power to transform clutter into peace of mind while also making the absolute most of what could easily be wasted space. Need a soft place to land? There’s a multifunctional built-in for that too. Imagine a window seat with thick upholstered cushions beneath your favorite window in the house, perfect to curl up with a book or just watch the world go by. Or perhaps you need a comfortable built-in dining set with banquettes upholstered in a fabric that can withstand three growing boys and Grandma’s famous spaghetti sauce. The bonus with built-in seating is the added storage found beneath a hinged top, perfect for extra linens, seasonal décor or craft supplies. “Functionality” could, however, mean something else entirely. Maybe the kids are grown and life’s big events now need a place to land. Built-in display nooks provide beautiful places to frame these moments in floor-to-ceiling shelves, perfect for layers of mementos, keepsakes and photographs. Celebrate memories by making them a physical focal point rather than just a mental one. Speaking of focal points, built-ins can also be used to bring an added sense of drama and intrigue to a special wall or corner. Built-in bookcases flanking either side of a stone fireplace, for instance, draw the eye and have the power to transform a pretty feature into an instant attention-grabber. Or built-in china cabinets in the dining room add beauty and function by creating a focal point, making use of empty space, and providing the storage that most homeowners crave. Just as a custom built-in can be designed to suit a specific purpose in your home, it can also be made to suit the specific look of your space. From sleek modernism to traditional elegance, built-ins can be customized to fit your tastes and décor by choosing the right shape, finishes, hardware, and decorative details. If your style can be characterized as eclectic and worldly, go with curved, scalloped edges as opposed to straight lines. If incorporating upholstery, use a globally inspired pattern such as ikat. Finish the look off with brass or copper hardware to give it a warm, natural tone. Since the finishes here are eye-catching, choose a soft neutral paint color to complete the piece. 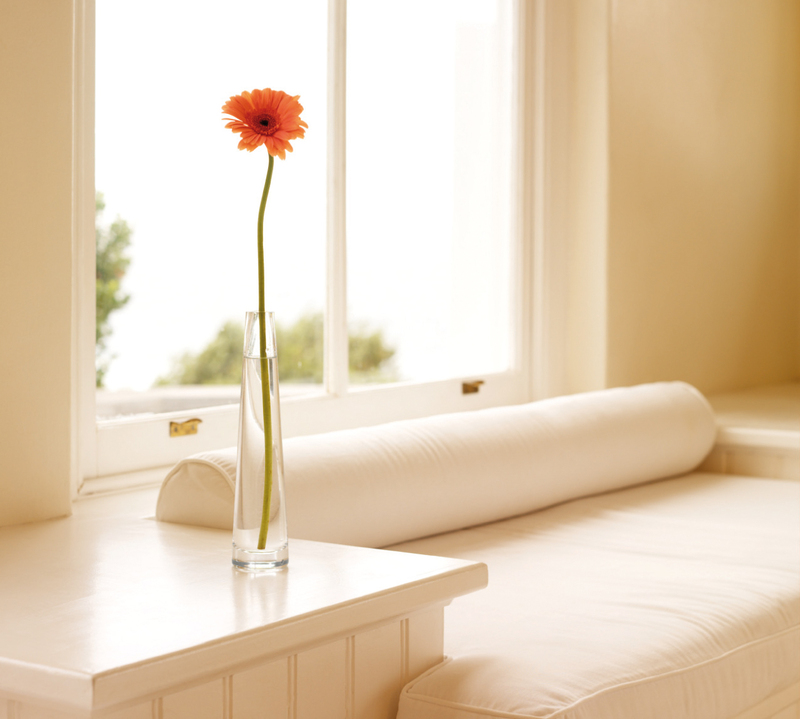 However, don’t feel limited to neutrals when choosing a paint color for custom furniture. While there’s never anything wrong with a crisp white or clean cream, take a chance and think beyond your comfort zone. Try a pastel hue, such as robin’s egg blue or pale olive green. Soft grays are also a great way to add visual weight to a custom built-in without straying too far from white. Not ready to branch away from a tried and true neutral? Leave your favorite white or beige on the outside edges of shelving, but layer a rich color on the inside surface. A pop of decadent peacock teal or barn red will add dimension to the piece and act as a unique backdrop for your display items or upholstered nook. Take it a step further by layering on patterned wallpaper. Keep the color scheme fairly neutral since wallpaper is a more permanent fixture, but the added texture and pattern will exude elegance in any space. When you hear the words “built-in,” it’s easy to envision weeks of construction, complete with dust, plastic sheeting, the smell of wet paint, and tools scattered across your once-spotless floors. While this could certainly be your reality, it doesn’t have to be the case. These days, clever designers and homeowners alike are finding ways to sidetrack a true built-in by creating the visual illusion of one. For example, crown molding can be added to the edges of a sleek pre-assembled bookcase to give the illusion of a custom piece. While you may know the real deal, visitors will be none the wiser as they admire your gorgeous new addition. Another way to create the look of a built-in when using separate finished pieces is to focus on color and scale. Repetition of shape and size, such as two tall matching bookcases with a low upholstered bench in between, will help unify the collection and give the illusion of one large piece of furniture. Unity is further achieved by painting the entire collection the same color. 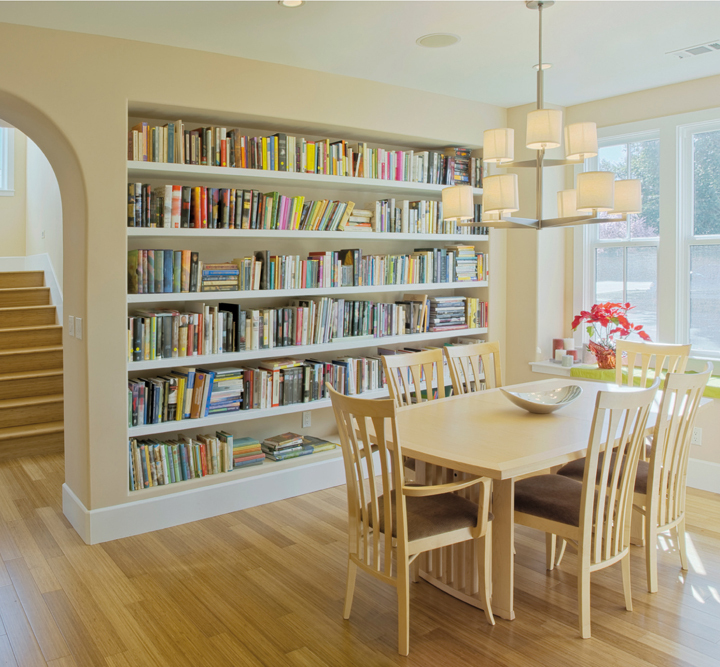 If a do-it-yourself built-in isn’t in the cards for your busy household, a contractor may be the way to go. Start by asking friends and family for referrals for carpenters, cabinet makers or contractors, or search online for these craftspeople. Once you have a short list of possibilities, make some calls and arrange for in-house estimates. 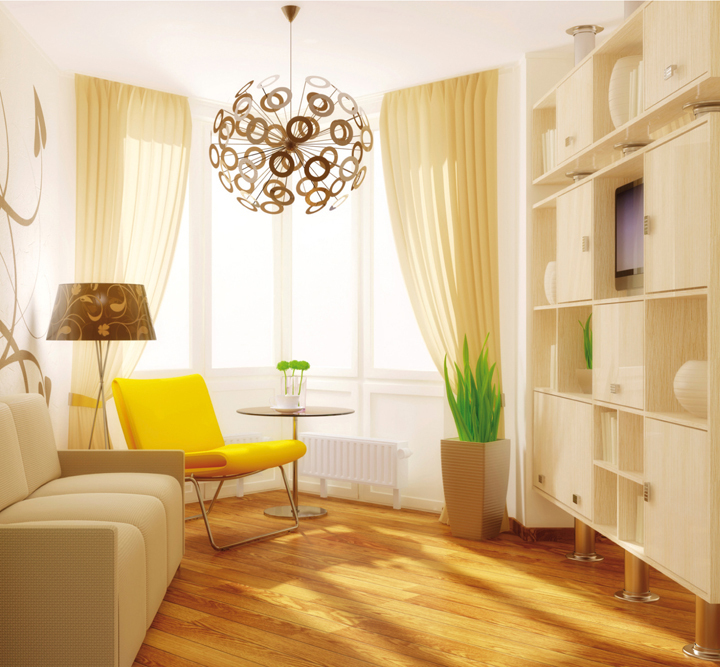 Be ready with a general description of the look and design you are after. A binder or folder of inspiration images torn from magazines or printed from your dream time online will help both you and potential contractors understand the extent of the work and the materials and time needed for completion. When it comes to selecting your contractor, trust your instincts. Seek out a contractor who asks you questions. 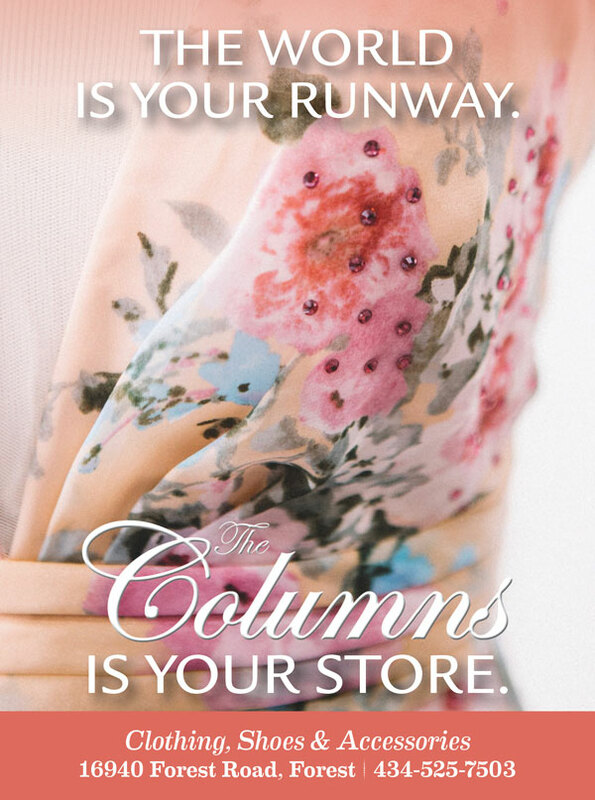 This shows that they aim to create something that truly suits your lifestyle and needs. Finally, be patient. It may take several meetings before finding the right contractor. After making your selection and agreeing on a timeline and budget, it’s time to make final design choices. Whether using an interior designer or making the style choices on your own, this is where a built-in comes to life and truly answers the needs of your family. If affordability is a deciding factor in your choices, this can be maintained by making a few simple concessions. For example, look for deals on drawer pulls rather than splurging on designer handles made of gold or vintage brass. Another option is to simplify the overall design in lieu of scalloped details and rows of drawers. Your contractor can help you determine which details and special features add to the overall cost. If it’s an upholstered built-in that you’re trying to design on a dime, look for sales on your favorite fabric, or keep your cushion design simple. Often it’s the special details — think tufting, skirts, welting and more—that raise the cost of your upholstery project. Built-ins have the dual power of satisfying the “type A” need for order, and the freedom to express individual style. While they may not be the one missing link in a quest for sanity, built-ins can offer ways to achieve customized harmony in your day-to-day life. Luckily, if you catch the bug and want one for every room, this is one home furnishing that can be built to suit.